Say Goodbye to Lumps and Coagulation! This product is formulated to to rapidly thicken Fun F/X Liquid Latex Rubber. It is not guaranteed to work as well with other brands of liquid latex. The 2 oz bottle will thicken 40-200 ounces of latex. The 4 oz bottle will thicken 80-400 ounces of latex. The 8 oz bottle will thicken 160-800 ounces of latex. The 16 oz bottle will thicken 320-1600 ounces of latex. Made from an acrylic co-polymer which mimics natural latex rubber (when dry) to retain your mold elongation. Directions: Use in a well ventilated area. 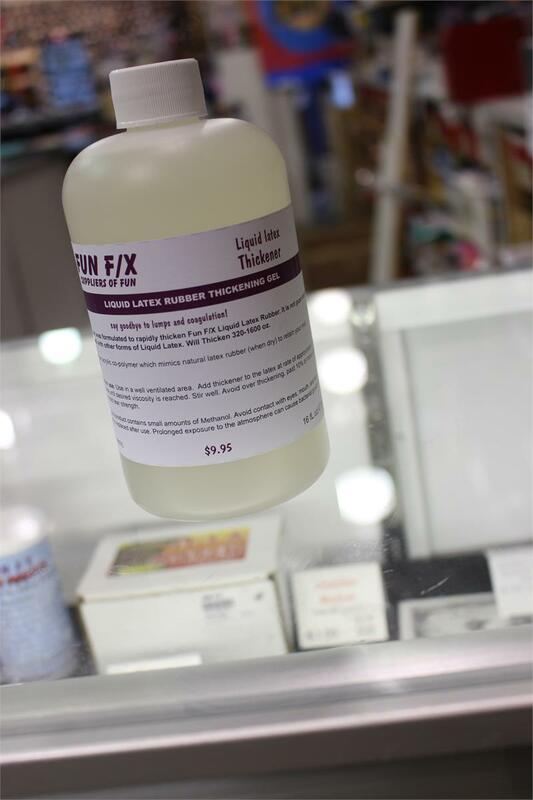 Add thickener to the latex at a rate of approximately 1% to 5% by volume until desired viscosity is reached. Stir well. Avoid over thickening past 10% or more, as this will reduce mold tear strength. Warning: This product contains small amounts of Methanol. Avoid contact with eyes, mouth and skin. Make sure lid is replaced after use. Prolonged exposure to the atmosphere can cause bacterial growth within this gel.